To modify a famous quote, most people don’t want to know how sausage or government policy is made. In both instances the process is messy and it is frequently difficult to see how a palatable end product will ever come into being. But for government policy in a democracy, it is very important to know the details, even if it takes decades for them to come out. 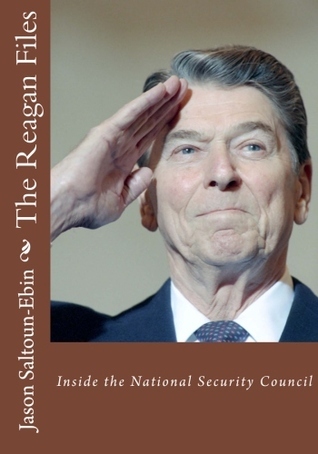 In The Reagan Files: Inside The National Security Council, editor Jason Saltoun-Ebin (@TheReaganFiles) takes the reader inside the room as President Ronald Reagan and his top advisors formulate American foreign policy from 1981-1988. This hefty and fascinating reference book isn’t an interpreted history, but the raw material upon which such works are built. Simply put, it is a treasure trove of information for those seeking a much deeper understanding of Reagan’s foreign policy. Although I haven’t read it cover to cover, I have gone through all of 1981 and selected entries from each of the following years, taking particular note of meetings held to discuss US-Soviet foreign policy and other issues of particular interest. This was the period of my early adulthood — Reagan’s election was the first I was old enough to vote in — and I was on active duty in the U.S. Navy for much of it, so I found a lot to be interested in. Mr. Saltoun-Ebin offered to send me a copy of this book after reading my review of The Triumph of Improvisation, James Graham Wilson’s look at the end of the Cold War. The volume isn’t yet a complete picture as many meetings during this period remain classified and parts of some discussions are redacted. I used “yet” in that last sentence because I am confident Mr. Saltoun-Ebin will be updating the book as more material becomes available. In his Editor’s Note at the front, he expresses a commendable explanation for why: “I believe that if we want our leaders to act in the best interest of the public, those in the White House now, or in the future, must be aware that their actions and decisions will be made known to the American public.” I agree. Where he can the editor lets briefing/decision documents and transcripts speak for themselves. When needed, Mr. Saltoun-Ebin provides excellent notes with background details and to place meetings in context with events. A great example is a meeting on November 9, 1982 to discuss modifying the sanctions imposed against the Soviet Union in response to events in Poland the year before. Those around the table could not know USSR General Secretary Leonid Brezhnev would die a few hours later, an event which began the process that eventually led to Mikhail Gorbachev’s ascendancy. Helpfully, most of President Reagan’s comments are bolded to allow readers to easily find them. Some meetings bog down but much of what’s here is riveting, especially for readers with some background knowledge about the period and the personalities involved — Secretary of Defense Caspar Weinberger and Secretary of State Al Haig put their alpha male credentials on frequent display and engage in spirited exchanges that edge close to bickering. Along those lines, one of my favorite sections, liberally highlighted, is from the April 1, 1981 meeting. Vice President George H. W. Bush chaired the meeting as just two days earlier Reagan was critically injured in an assassination attempt. Secretary Weinberger casually tells the group his Defense Department has begun formal talks with Saudi Arabia about the sale of AWACs aircraft, a decision Bush and Haig are sure the president hasn’t made. Weinberger disagrees and the back-and-forth that follows highlights the loose management style cited by many of Reagan’s contemporary detractors (and eventually led to Iran-Contra). This isn’t a book you’re likely to pick up for a rainy-day read. But, if you’re doing research on the period or the president and his advisors, or if you’re simply interested in knowing more about how foreign policy was formulated toward the end of the Cold War, this is an invaluable resource. An additional resource which includes much more material to study, including scans of the original documents used to create the book, is the editor’s website: The Reagan Files.